A great big thank you to my readers for all of your suggestions and comments regarding my poor little basil plant. I’m proud to report that it is doing much, much better. I gave the plant a nice hosing down to remove the spider mites (I came to the conclusion that it wasn’t poop because I never saw any worms/caterpillars/creepy-crawlers). It still has a few chomp marks on some of the leaves but I’ve been able to pick around those when I want to use it in my cooking. Between being re-potted by JUP Mama, aka the Lady with the Green Thumb, some fertilizer, and a few days in the A/C, it’s got a new lease on life. I even used a great big stalk of basil for this amazing summer pasta recipe from The New York Times. I wished I had watched the instructional video first though, because author and cook Melissa Clark totally had a better way to cut the corn off the cobb. JUP Mama also took me to Lowe’s to load up on some gardening supplies. We had to get a new pot and saucer for the basil plant, some fresh dirt, and some fertilizer. Hey! It’s our totally messy, unorganized garden shed. Welcome! Mixing up the Miracle-Gro… again, maybe a slight obsession with lime green household products? I purchased this adorable succulent, a rainbow elephant bush (Portulacaria afra variegata), which I promise to keep alive through the summer. I’m in love with the tiny, rounded leaves. I wanted to share with you a DIY project that JUP Mama and Daddy gifted us for the patio. In case you didn’t know, both my parents are super crafty. JUP Mama is an artist (quilting, painting, drawing, color-matching… you name it, she can do it!) and Daddy is a carpenter. They built our cute little home in Jupiter Farms together and have remodeled it so many times since the mid-1980s that it’s nearly unrecognizable. My second childhood bedroom is now the quilting/craft room and the converted garage is now an office/baking room. They recently put in a new pool together (yes, by themselves, no contractor needed). I will have to share that in another post because we’ve had a FUN summer in the new pool! 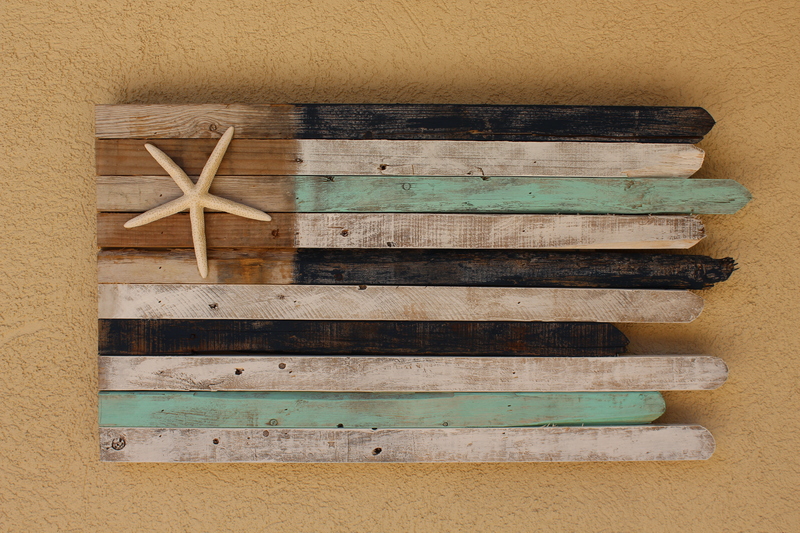 Look at this nautical “American flag” they created for us! It’s in our wedding colors, seafoam and navy, and fits the decor of our “beach house” perfectly. Here’s an up-close look at their handy work. I thought this would be a fun way to gauge y’all’s interest – would you like to see a post about how to create this flag? Or do you want to skip the DIY and have us create it for you? Shoot me an email at NativeJUP@gmail.com or post a comment below. And here’s my frog friends. They love to jump out at me when I water my plants. It’s delightful… NOT. That flag is SO cute! I am super impressed your parents made it! Thanks! They love crafting things together. Thanks Suvi! Where did you stay while you were in Florida? Glad to see your basil plant is doing well! Love the flag! Thanks Leah! Safe travels today! Love the flag! Are those picket fence boards?